The book shows the most effective way of balancing the fundamental pillars, assisting the modern day manager by handling a dynamic, constantly adjusting workplace, which easily adapts to all challenges and changes. 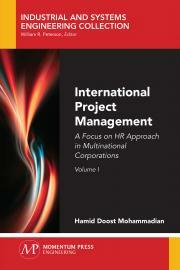 It was written by an international management professor and technology expert speaking directly to managers and engineers about the four dimensions of international project management; people, value engineering and multinational cooperation. International Project Management will bridge the gap of knowledge and highlight the modern and effective ﬁndings related to international project management, value engineering, and multinational cooperation. The author teaches about speciﬁcs of international project management and he deﬁnes what exactly a project should contain, sharing personal examples as well as models that include all the required steps to reach the set goals. Readers will be able to immediately implement these skills into work, ﬁnd the motivation to move forward, and have conﬁdence easily manage and complete tasks. Hamid Doost Mohammadian obtained his doctorate degree in business strategy, a master of industrial engineering and a bachelor of computer hardware engineering. Having worked in a key position offshore project for one of the largest gas companies at the Persian Gulf (POGC), in his twenties, shows his extraordinary managing abilities. Presently, he is professor for international management and researcher at the University of Applied Sciences (FHM) in Germany.